For the last few days a Siberian storm from the north has kept most Greeks inside their houses, close to the heating. In Athens it snowed, but here on Lesvos the sodden land finally had time to dry up. At the seaside however the waves sprung over the streets and quays and where there are fences, you get a pretty good idea for how we mistreat our earth: the fences were full of plastic blown out of the sea. You may well wonder what the fish are eating and how much of that plastic ends up in the fields where our food is grown. Wherever you look, you see plastic, even deep in the Lesvorian woods. Although I have to admit that the island gets cleaner because the regard for nature is increasing by the year. Thanks to the really cold weather you may only find plastic on the fields these days. Wintertime normally does not offer such a big choice in vegetables, but during the normal Greek generous winters there might at least be salad, spinach and other green leafy vegetables on the fields. With the cold much of that got lost and we have to make do with frost resistant plants like cabbages and beet roots, that is, if you really want to eat products from the open air and not from glass houses. Cabbages are mostly associated with countries in the North like Russia, Poland or Germany, but the Greeks also eat plenty of cabbage in the winter. The most popular dishes are lachano salata (finely chopped cabbage leaves with olive oil and some vinegar), lachano vrasto (cooked cabbage leaves seasoned with olive oil, mostly a simple but surprisingly good dish because of its nearly sweet taste) and lachanodolmades (cabbage leaves filled with a mixture of ground beef, seasoned with the lemon sauce avgolemono). There even is a Greek myth explaining how cabbages came into the world. Once Dionysos, god of wine and parties, was wandering through Thrace with his followers, the mainads. King Lycourgos of Thrace felt threatened and had Dionysos and his party arrested. Dionysos became so angry that he made the king go mad. Lycourgos became convinced that his son was a grapevine that had to be cut down. 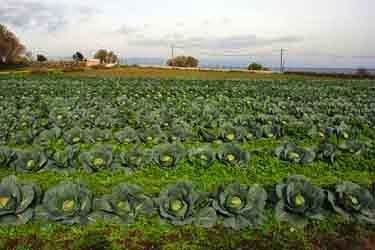 When the king realised his mistake, he started crying and from his tears grew cabbages. And because of this story – which is very old - Greeks believe that you should never plant cabbage near a grapevine, because then there will be no grapes. They also believe that eating cabbage before you start drinking will give you a solid stomach for the alcohol or, when you forgot that, eating cabbage might solve your hangover. Cabbage was not only the food of the poor, but also of honesty. One day the Greek philosopher Diogenes of Sinope was searching for an honest man. He met a man who was known for his flattery to the rich. Diogenes said to him: “If you would eat cabbages, you would not have to flatter the rich”, and the man very cleverly answered: “When you flatter the rich, you don’t have to eat cabbage”. Cabbage is health food (it contains vitamin C, iron, calcium and potassium) and the ancient Greeks and Romans believed strongly in its healing power. Like a certain Erasistratous, a Greek doctor who lived three centuries before Christ, who gave his patients cabbage when they had stomach problems and also spewed blood. According to Pliny the Elder, starting the day with eating raw cabbage seasoned with oxymel (a syrup of water, honey and vinegar), coriander, rue, mint and cup plant (Silphium perfoliatum) would be good against headaches, poor vision, specks in the eyes, spleen and stomach pains and against insomnia. The Roman magistrate and military officer Cato used a paste of chopped cabbage leaves to heal wounds. And in the 18th century no ship left the harbour without cabbages. Like the famous Captain Cook: on his first voyage, when he encountered a heavy storm which resulted in many wounded men, he had his ship's doctor treat the wounds with a paste of cabbage, as did Cato many centuries earlier on the battle fields of Rome. It worked and since then ships only sailed with sauerkraut (fermented cabbage) and raw cabbages. With a sharp knife, cut out the hard stem from each cabbage leaf. Lay the leaf flat on a working surface, and spoon the filling onto the edge of the leaf. Coat the edge evenly, then roll it up tightly. If the cabbage leaves are small in size, take two leaves and arrange them so that one edge overlaps the other; line the leading edge with the filling and roll it up. Serve garnished with sprigs of parsley or mint. The original recipe was called Acorn-stuffed Cabbage Rolls. In ancient times acorn was a popular food, but since we no longer eat them, they are replaced by nuts. How healthy it may be and even with nuts, this recipe will not be my favourite, because everything is raw, even the bread (Grind 2 cups sprouted barley and ½ cup of dry figs together and knead. Shape into a loaf, and set aside for 12 hours before serving). I never was a big fan of cabbage, but on Lesvos I started to appreciate this vegetable more and more. It is perfect to stir-fry and in many other ways can be transformed into a tasty dish. And one cabbage can last you a few days. Last week I saw in the paper a photograph of a man from Agia Paraskevi who harvested a cabbage of 11 kilo’s. Such a big one will last you a whole winter! Although once a cabbage is cut, it will rapidly lose its vitamins. On the Internet I found a website with tasty looking and more modern recipes with cabbage than the one of Pyhtagoras (the recipe of the raw salad from Pliny the Elder does not seem that bad): Greek cabbage recipes from Yummly. Not all the recipes seem very Greek to me, but they are all made with Greek ingredients. The coming days I will try them out because the end of the winter does seem to be very far away and Pythagoras did forget another property of cabbages: it warms the soul. And a warm soul we are going to need very badly for the coming cold carnival.